Cut Off & Finishing Discs - Lab Depot ltd. The Red Flash Disc is the most popular and finest disc available from Keystone Industries. The cut-off wheel quality is strong, fast and free cutting on all chrome, precious and semi-precious alloys. Made of aluminum oxide, the disc can withstand up to 25,000 rpm. The Ultra-flex Disc is the thinnest disc available to the crown and bridge craftsman. This disc is two-thirds as thin as and more flexible than the Ultra-thin Disc, supplementing the Ultra-thin where maximum thinness is required. These are excellent for interproximals and margins. Made of silicon carbide, the gray color discs work best between 10,000 and 12,000 rpm. These Veri-Thin Discs are much thinner than the regular Joe Dandy Discs, but still maintains the strength and fast, cool cutting qualities. 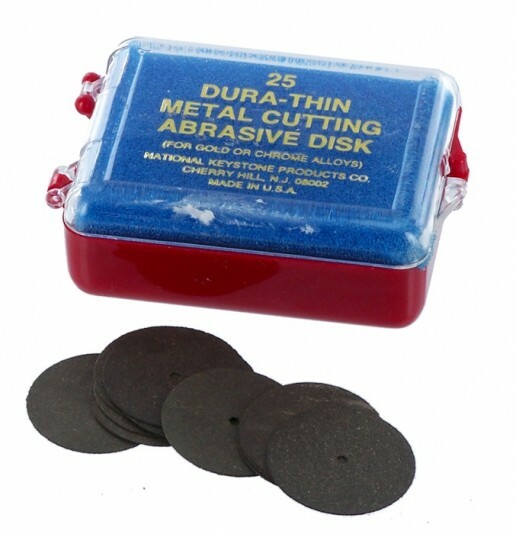 These discs, made of silicon carbide, are especially suited for cutting and finishing porcelain and gold. Ideal speeds for the discs are between 10,000 and 12,000 rpm. Keystone Industries Ultra-thin Abrasive Discs have the exceptional combination of thinness, strength and cutting qualities, which have made them an indispensable industry standard. These abrasives are used for fine cutting and finishing on porcelain interproximals and margins. The pure fine silicon carbide abrasive is a unique formulation that will not discolor porcelain. Best used between 10,000 and 12,000 rpm.